Some may think Walt Disney World is only meant for making memories, helping dream comes true, bonding with family members and riding fabulous rides, but there is so much more to one of the most famous parks in the world. I recently got back from visiting Disney with my family. It’s one of our favorite places and I must admit it’s one of, if not, the most magical place on Earth. While exploring each park – Magic Kingdom, Animal Planet, EPCOT and Hollywood Studios – I discovered just how dedicated Disney is in supporting the environment. They give back in numerous ways, but here are four ways the park respects the planet. The largest of all four parks, Animal Kingdom, is a site for sore eyes. The most sought after ride is the Kilimanjaro Safari. You take a “real” African safari coming up close and personal with some of the most precious animals like giraffes, lions, white rhinos, ostriches and elephants. Of course, to many, keeping animals at all for public viewing is controversial. And with more than 1,700 animals from 250 species, Disney has its work cut out when it comes to ensuring conservation and animal care. To the benefit of the creatures who live there, Animal Programs promotes species conservation, animal rehabilitation and the reintroduction of endangered species. Disney is even a licensed wildlife rehab center. Since 2009, Disney has invested $15.5 million in reforestation and conservation benefiting threatened wildlife, combating climate change and helping local communities. To learn more about Disney’s nature conservation, jump here. The Experimental Prototype Community of Tomorrow (EPCOT) is known for the massive ball everyone encounters as soon as they step through the gates, but this park has all sorts of educational exhibits. In particular, Living with the Land is a 14-minute boat ride, where you learn how Epcot grows its own produce. You float through several greenhouses that grow all sorts of produce including, bananas, jackfruit, pumpkins, lettuce, blue agave and even nine-pound lemons (amazing to see in person). 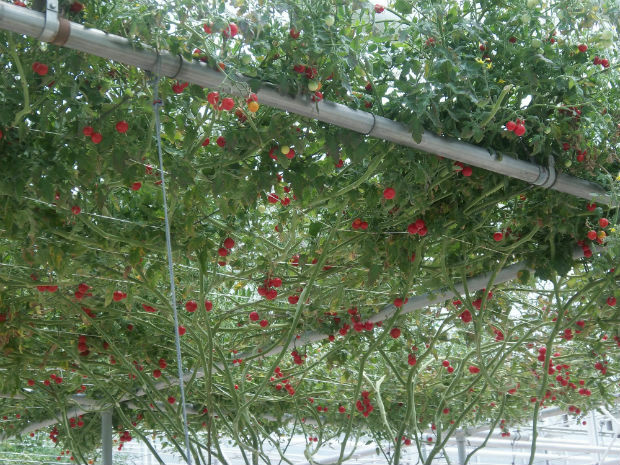 One of my favorite parts was seeing tomatoes growing on trellises, thanks to its “vertical growing techniques.” Everything grown at Epcot’s greenhouses is used at every restaurant located within the park. Now, vegans and animal lovers might not be happy about this, but Epcot also has an in-house Aquacell, where they practice aquaculture or “fish farming.” Shrimp, catfish and alligators can be seen in giant tanks from the boat. One good thing is, Epcot relies on animals and nature to interact and keep the environment growing. For example, they stay away from harmful chemical pesticides, and rely on insects like ladybugs to do the job. Don’t put it past Disney when it comes to protecting the planet for future generations. They founded their very own organization, the Disney Worldwide Conservation Fund, in 1995, which is important to their environmental efforts. A big part of DWCF is educating kids to ensure they have “lifelong conservation values.” What better place to reach children than Disney? They also have a grant program providing financial support to aid in the study of wildlife, conservation development and offering knowledge about critical ecosystems all across the globe. In addition to hands-on learning, Disney reaches little ones through Disneynature films. If you’re a parent, you probably took your kids to see one of these flicks or heck you could have gone yourself just because the movie looked good. Such films include, “Chimpanzee” and “African Cats.” Just as much as kids love Goofy, Donald Duck, Woody, Cinderella and Snow White, they sure do love animals. Did you know Walt Disney World covers 40 square miles or more than 25,000 acres? With that much land being used, it has to work extra hard to conserve energy. So, how is it done? First, they have long-term goals set like achieving net zero direct greenhouse gas emissions and reducing electricity consumption by 10 percent, along with pursuing renewable resources of electricity to reduce emissions. Lighting is a huge factor for Disney. Between rides, parks, resorts and their Main Street Electrical Parade, that’s a lot of electricity. For example, one way Disney helps is during Christmastime, especially with the 1,500 trees located at the resort. All hotels glow with more than 700,000 LED lights, resulting in using one-tenth of the power of traditional light bulbs. Disney gives back to the planet in so many other ways. To educate yourself, click here to see their eco-approach. Yes, the resort covers quite a bit of land, using a lot of the environment, but at least they’re trying to establish a smaller eco-footprint. Even founder Walt Disney respected the environment. I’ll leave you with this quote from Walt himself.